When we first reviewed the Porter-Cable PCCK640lb, it was adequately certain that the company had even if momentarily, taken a break from the black and grey cordless tools that we had all been seeing in the past. The new color scheme in fact, reminds us of those colorful toys we cherished in our childhood. But the bumpy surface successfully hides the technology used in the device. On first use, you will also understand that the 20V max slide makes this one resemble some of the other tools that you have already used. To set the record straight, we decided to come up with an elaborate Porter-Cable PCCK640lb review for you. Short in size and lightweight. Easily accessible with the belt. Can be difficult to use with both hands. The tool is powered by torque of 1450 lbs. A 0.25” hex chuck that can be quickly changed with one hand. The total length of the tool is about 6.2”, which felicitates seamless operations on most surfaces. The device weighs 3.2lbs, which makes it neither too heavy nor too light for use. There is also a single LED worklight that is built-in; the worklight is especially built for the auto aftermarket. The tool also comes equipped with a battery fuel gauge. There are 2 magnetic grip holders. For the sake of safety, the company has employed two rubber bumpers. There is a removable belt clip integrated in the tool. 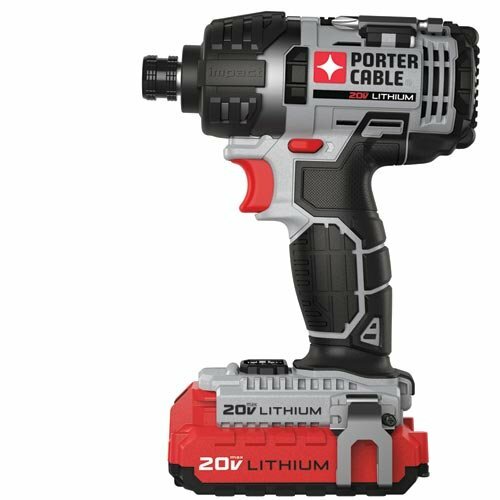 The Porter-Cable PCCK640LB utilizes the best and what some say the latest li-ion power tools platform. The company claims that the tools included in the kit will be sufficient to run the user through some of the most demanding fastening applications. Also, a design that is both lightweight and compact helps the tool gain significant ground in this Porter-Cable PCCK640lb review. The best of Li-ion: One of the first major advantages to the kit lies in the way it leverages the Li-ion battery system. The tool employs the latest battery platform for Li-ion. This makes the PCC640 driver a long-lasting tool that suffices for enough power to get long jobs done. The variable and high performance speed transmission along with the torque motor makes sure that jobs are done easily. A fast spin: The device is generously fast and spins at 2,900 rpm which is comparable to the 18V PCL-180ID by the same company. This means that the company has made sure that the drill shoots like a laser through most wooden surfaces. Definitive edge: To the credit of the company, they have heroically managed to box up all that power in a tool that measures just half a foot and weighs only 3.2 lbs. The company has maintained that the PCC640 has been built to enter spaces that are already cramped. The ergonomic design of the tool, a slip-less grip and high-strength impact internal block further allow the tool to retain a competitive edge. There is a built-in LED worklight that makes it a lot easier to work at areas that are not evenly sit. The rubber bumpers ensure user safety and protect the device against wear. One-handed use: Most of the devices in this range are small, but are often difficult to use with a single hand. That is not the case with this device. The device has a 0.25” quick-change chuck along with a 2-bit feature for storage. This makes it a lot easier for the user to store and change bits. Also, a built-in hook means that the device is always within the reach of your arm at the work site. Porter-Cable PCCK640: Built for What? Porter-Cable PCCK640LB Impact Driver Kit comes from a company that has been manufacturing power tools for over 100 years. The tool is among those performance and quality driven tools that Porter Cable has always excelled at. The drill can drive through wood seamlessly and as it would appear, this the principal job that the company will have assigned the drill.